Pie and Coffee Christmas, Houses of Worship, Itinerant Communicant, Orthodoxy Merry Christmas! Enough of this pre-Christmas and post-Christmas blogging; today is Orthodox Christmas. Last night I stopped by the Ethiopian Orthodox Tewahedo Church in Nairobi a few hours before Christmas mass, which I considered attending but was warned off from by a couple non-Amharic-speakers. Here’s a photo of the inside I took at the urging of a member of the congregation. The painting of the three bearded men depicts the Trinity. I was told that the TV screen, though not working at present, is intended to give people a view of what’s happening in the inner sanctuary when the curtain is closed. I love watching people showing up for Ethiopian mass, the women in white packed into cars, emerging like circus clowns turning into butterflies. 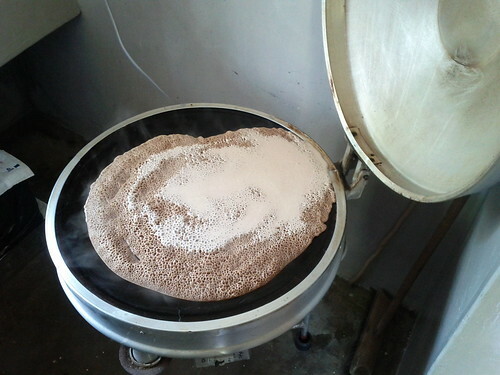 My Ethiopian Orthodox Christmas highlight was baking a loaf of injera, using an electric mitad. Sounds like math. You can see why philosophers before the Industrial Revolution made no distinction between mathematics and religion. next time write something true not just anything u think about.the article you have written is partly wrong especially about the screen.first of all it works and secondly i am the person who holds a laptop and guide the people through the mass which is viewed on the screen.the internal sanctuary is not supposed to be viewed to people when the curtains are closed.i would like it more if you write your articles with accurate information. Tsega: You are absolutely correct, as I learned a few weeks later when I actually attended mass at this church. I am a little surprised to find that I never blogged that visit. 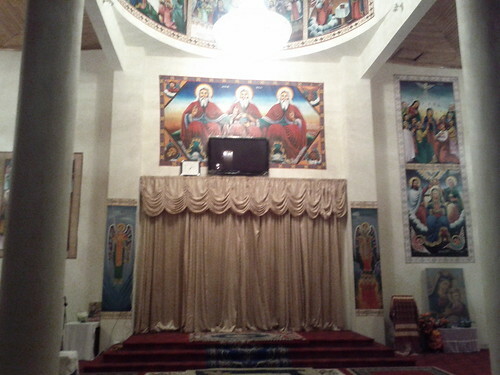 The screen provided the text of the liturgy in IIRC English, Amharic, and Ge’ez.